We have received your contact information – thank you! A great experience to get an idea if you want to go racing. I learned new skills and the coach was always helpful. I had a great day and learned how to properly drive a car. Coach helped me gain confidence and helped me to be much smoother in my driving. Became comfortable with how car acted in the wet (skid pad). Great combination of positive and constructive comments. Coaching was clear and delivered calmly. Related instruction to every day driving. Very good at correcting my bad habits. Coach was very clear and patient with me. Enjoyed the day very much. I was made to feel very at-ease. Thank you. I wanted to reach out again and thank you for an amazing day. I’m so glad you pushed me the way you did to get better. The needle is in the arm now brother. We all know I’ll be back. And I’ll be assembling a crew but sticking with you. 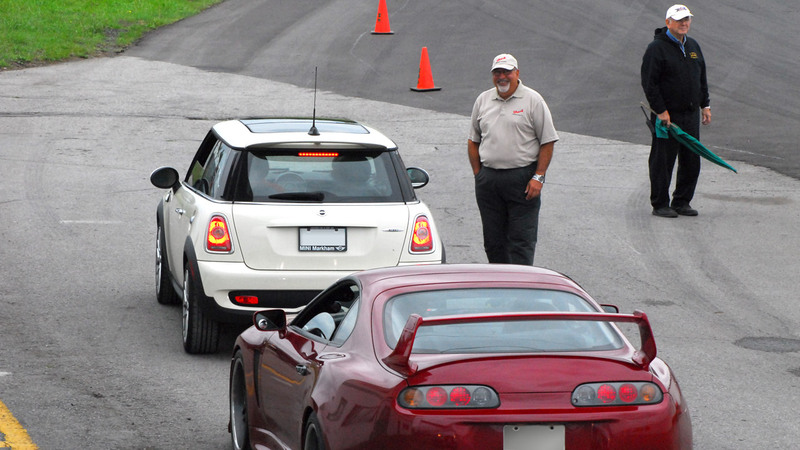 Excellent instruction and learned a lot about car control. Loved the skid pad. Clear instructions. Was able to see what did and did not work in a safe environment. Found out the limits of my car beyond my experience level. Loved the slalom exercises. Benefited from the detailed breakdown of a corner. Enjoyed the school – very patient instructor who was able to narrow down my problem areas. The Coach stayed with me all day and helped me successfully break some bad habits. Skid pad was particularly helpful. Instruction was very detailed and I particularly enjoyed having the Coach demonstrate what they were taking about in the classroom. Very informative day. Learned what heal and toe was and smoothed out my shifting. Also learned about hands on the wheel!! Classroom was the best. Learned a lot. I liked the classroom sessions the best plus the opportunity to go on a track and try out some new techniques. A very enjoyable day and a great experience. I will be back! Hi ,thanks so much for the driving experience last Saturday (I was the “little old lady” in the Mazda 3). Your patience was infinite and your encouragement and enthusiasm so supportive. I learned so much and feel I’m a better, more confident driver now. Even my husband has (somewhat reluctantly) admitted he sees a huge improvement. Best wishes. Instruction was very detailed and I particularly enjoyed having the Coach demonstrate what they were talking about. Coach very experienced, patient, and communicated feedback well. Loved the skid pad and would have liked more time there. Coach made sure he understood my driving issues and tailored that information into my sessions. Great classroom and learned a lot of technical stuff. Coach patient, calm, enthusiastic and gave clear instructions. Learned to be focused. Skid pad was the best part. © 2019 Brack Driving Concepts. All rights reserved. Site by Intelliga Communications.